As the debate over 3D-printed guns wages on, most people are ignoring the implications they have against fighting oppression and tyranny across the globe. As the debate continues about whether or not 3D-printed firearm plans should be banned, even the ostensible pro-2nd Amendment folks are worried that shooting rampages will occur as a result of these plans being published online. But the reality is far different. For generations, advocates of private gun ownership have been fighting exhaustively through political channels to protect their right to keep and bear arms. Gun owners even have one of the strongest lobby groups in Washington, the highly disappointing NRA. Yet over the years, gun rights continue to diminish in America, despite the constant political campaigns by the NRA and politicians that claim to support gun rights. However, in the past few years, one guy with a good idea has managed to do more to protect gun rights than the NRA has in decades of political involvement. Cody Wilson is the founder of “Defense Distributed” and the “Wikiweapon” project, which allows anyone with a 3D printer to create their own untraceable gun in the privacy of their own home. While alarmists claim that 3D-printed guns will be the end of humanity, the fact is that these plans have been online on torrent and dark web sites for years and we’ve yet to see a single person killed with one. What’s more, as the gruesome murder-suicide on a college campus in Walnut Creek, California illustrates is that people don’t even need these plans if they want to make their own untraceable gun. Scott Bertics built the gun he used to shoot himself and Clare Orton without anyone knowing and entirely through legal measures. Psychopaths who want to cause harm to others will cause harm to others using any means necessary. Limiting the ability for law-abiding citizens to protect themselves will never change this. Wilson makes no secret that the intention behind distributing CAD files to create homemade guns is to make gun control measures obsolete and bolster the Second Amendment, which is under continual assault from anti-gun activists. As Wilson explains, these files could be used to empower oppressed people all over the world who’ve been disarmed and ruled by criminals and warlords. “We put a lot of world governments on notice, and I think that’s good in the history of the balance of power between sovereigns and subjects,” Wilson told the Brown Political Review. 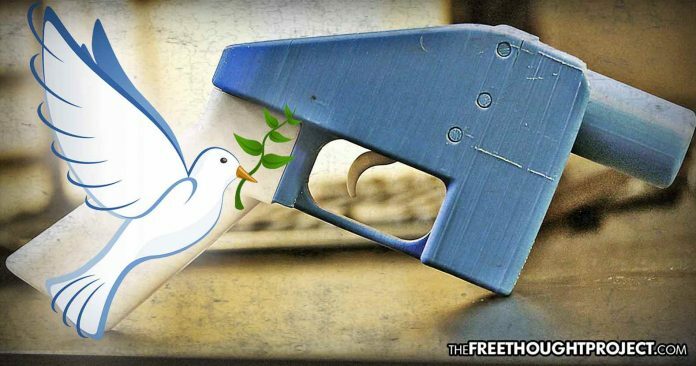 From the Armenian Genocide to the Nazi Holocaust to “Black Gun Codes” in America: throughout history, societies who have been disarmed by their governments have given way to massive bloodshed. This is still the case today in countries who’ve turned in their guns. Depending on the current government, life in disarmed societies can go on peacefully for a while. However, in some cases, citizens — men women and children — are slaughtered by the millions. Even when gun control seems to work in the short term, the scapegoatists are never satisfied. As we are seeing in the United Kingdom, politicians are now going after knives as the “evil weapon” that no law-abiding citizen should ever need. For those who don’t recall, the disarming of citizens took place in the US and was used as a means to slaughter blacks and Native Americans. When the first U. S. official arrived in New Orleans in 1803 to take charge of this new American possession, the planters sought to have the existing free black militia disarmed, and otherwise exclude “free blacks from positions in which they were required to bear arms,” including such non-military functions as slave-catching crews. After the passage of these laws, numerous studies concluded that the newly freed slaves had essentially been rendered defenseless against groups like the Ku Klux Klan. Disarming them, essentially made them slaves once again. Guns — in the hands of good people — level the playing field against guns in the hands of bad people. It is this simple. Just imagine the power a 3D-printed gun would give a mother in an African village as warlords come through hacking off the limbs of children with machetes. With enough of the villagers having these guns, they could effectively defend themselves against large groups of tyrants even if they had automatic weapons. Sadly, the statists only see the potentially negative aspects of these 3D-printed guns. “The people who make them will be state actors or well-financed criminal cartels who have the ability to execute well-organized criminal attacks in the United States and elsewhere,” said Avery Gardiner, the co-president of the Brady Campaign to Prevent Gun Violence. This protectionist attitude is self-serving and one-sided and ignores the benefits of an armed society as well as history. And, it only serves to further the oppression of those who cannot defend themselves. While it would certainly be an amazing thought to be able to live in a world without guns, that is simply not the case. Until it is the case, anyone who wants to defend themselves and their family, should be able to do so in any manner they see fit — as the only other option is tyranny.